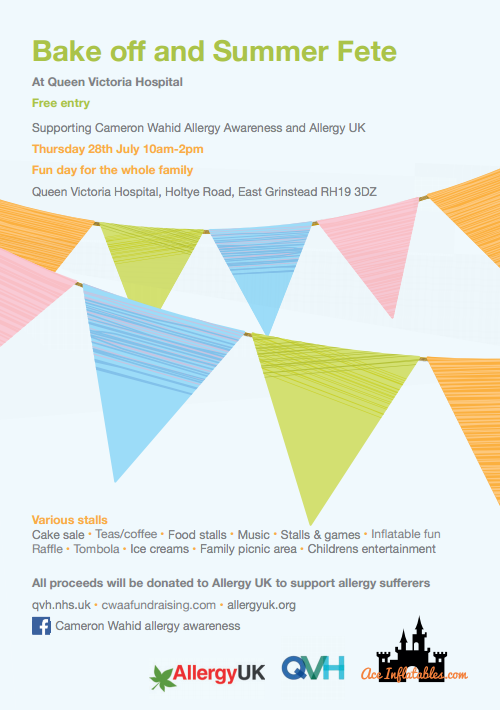 We are pleased to announce that in support of CWAA and Allergy UK, the Queen Victoria Hospital, East Grinstead will be holding a bake off and summer fete. The day will include a staff bake off competition, with cakes available for those with allergies. The cakes will be judged by Riz Wahid, Carla Jones CEO of Allergy UK and Richard Tyler, CEO of QVH. All money raised on the day will be donated to Allergy UK. Come and join us at this Charity football tournament and family fun day in memory of our son Cameron, hosted by Lingfield FC minis. If you are interested in hosting a stall or providing your services to help on the day, please do get in touch with us on Cwaafundraising@gmail.com, or message us on Facebook under Cameron Wahid Allergy Awareness. All proceeds raised will go to our friends at Allergy UK. Allergy UK is the leading national charity providing advice, information and support for those with allergies.